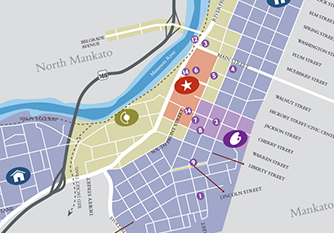 Traveling to, in, and around City Center Mankato is easy and efficient, with a wide range of transportation options available. Ample on street and ramp parking is available in the City Center. City Center parking ramps and parking lots are located on Civic Center Plaza/Hickory Street, Walnut Street and Second Street. Handicapped parking is available in designated areas. For a map of the ramps and lots in the City Center, see City Center Parking Map. Mankato’s City Bus is your on-time destination. It’s also the clean air alternative. Did you know that on average, riding transit cuts hydrocarbon emissions that produce smog by 90 percent, carbon monoxide by more than 75 percent and nitrogen oxides by a range of 15 percent to 75 percent? Mankato’s buses are new, clean, reliable and inexpensive. All buses operated by the Greater Mankato Transit System are wheelchair accessible. No pre-scheduling is required to access this service. All of the buses, with the exception of the Para-transit vehicles, are equipped with bike racks. There is no additional charge to use the bike racks, and any of the friendly drivers will be happy to show you how quick and easy the racks are to use.